The requirements for non-metallic materials included in clause 7.4 of IEC 60079 Explosive Atmosphere Standard has been expanded and developed in the last edition, making the assessment a more complex process. Test methods have also been expanded permitting alternatives to determine compliance. In this article Certification Management Limited attempts to explain a simple approach which can be used for product assessment. Unwanted ignitions are older than mankind. Lightning triggered fires long before humans inhabited the earth. In 1753 the first lightning conductor was invented, enabling electrostatic hazards as the sources of ignition for fires to be significantly reduced. Today the International Electrotechnical Commission, a non-profit organisation, develops and publishes standards concerning electrical technologies, of which a truly wide variety exists in the modern world. Headquartered in Geneva, Switzerland, IEC standards reach over 150 countries. The IEC coordinates efforts carried out in different countries and unify them. Explosive atmosphere standards deal with the design, use, and selection of equipment to be used in environments with the potential presence of an explosive atmosphere. Covering the equipment used for the detection of dangerous gases, explosive atmosphere standards go on to address the work-specific equipment in these environments, with attention paid to both intrinsically safe equipment, flameproof, increased safety and other protection methods. Electrical and non-electrical equipment are addressed separately, given the significant difference in techniques applied to handling the two, and special attention is paid to mining because of the especially notable combination of a dangerous atmosphere and dangerous work in one industry. The International Electrotechnical Commission (IEC) 60079 series of explosive atmosphere standards covers a wide array of important considerations when it comes to potentially explosive atmospheres. Dealing with general equipment requirements, gas detectors, intrinsically safe equipment, a variety of other different methods of equipment protection, and moving on to the classification of areas, material characteristics, and some industry specific standards, the IEC 60079 series is truly expansive. IEC 60079-0: specifies the general requirements for construction, testing and marking of electrical equipment and Ex Components intended for use in explosive atmospheres. Clause 7.4 applies to non-metallic parts, excluding glass, but including any external part that is attached to the enclosure and is non-metallic. Paint is also considered as a non-metallic material. The potential for charge to be transferred to metal parts isolated from earth, such as enclosure fixings or clips, are also considered. Rubbing by an incompatible material, such as may occur when cleaning. Inductive charging – this assumes a conductive part, influenced by a magnetic field nearby, cause separation of the opposing charges in the conductor. If the conductor is then connected to earth, a discharge can occur at the point of connection, depending on the strength of the magnetic field. This type of charging is unusual and is only likely to occur if a conductive material is not earthed and is introduced into a hazardous area, and an electric field, without an earth connection, large electric machines are an example of equipment that may produce circulating currents and large magnetic fields. Of course, the presence of a charged surface is not in itself a problem, unless it is discharged rapidly which enables a spark to form, and that would then have the potential to ignite a flammable atmosphere that may be present. High humidity in the atmosphere allows charge dissipation to occur more readily and the presence of dirt or grease limits or prevents charging by rubbing. Most electrostatic hazards occur as part of a process, although can occur through a person’s movement, which makes their clothing rub. Solutions involve avoiding the build-up of electrostatic charge, since the absence of an earthed conductor that could enable rapid discharge cannot be assured. Low resistance polymer material that meets a surface resistance test of <109 Ohms at (50%+/-5)% relative humidity. This usually requires an additive such as carbon to the mix, usually making the product enclosure black, other additives are available but can give variable results, some experimentation to obtain the right mixture is advised. Using too much additive will effectively make the enclosure conductive and therefore clearances to live parts inside must be examined. Limitation of surface area, which is not practical in most applications because Apparatus Group IIC is normally required and the limited surface area permitted is only possible on the smallest items. The addition of an earthed frame around the plastic part enables charge to dissipate slowly and therefore larger areas are permitted. However earthed frames are not a practical solution on most equipment. Limitation of non-metallic layer bonded to a conductive surface. The layer must be thin enough to permit gradual leakage of charge (0.2mm for Group IIC), whilst preventing spark discharge. Paint applied to a metal enclosure is considered under this clause. In this solution, a significant amount of static charge will dissipate across the insulating layer. A 4kV breakdown test is also permitted to prove a layer will dissipate safely. Conductive coating (dissipative coating) which allows a clear coating to be applied which can dissipate charge gradually. Fixed installations may be marked ‘X’ and preferably labelled (29.12), the traditional ‘Clean only with a damp cloth’. The intention of this clause, 7.4.3, is to avoid the danger of ignition due to propagating brush discharges. To create a propagating brush discharge, it is necessary to have a sheet or layer of high resistivity and high dielectric strength, with the two surfaces highly charged at opposite polarity. This condition might occur in a powder conveying or liquid droplet spraying application. Low surface resistance as per Group II solution (a) above. A thickness of >8mm, thus highly insulating the surface and preventing breakdown. Certificate X mark for fixed installations where the installation location will not have a prolific charge-generating mechanism present. With most products undergoing approval for Group II and Group III applications, these requirements can be contradictory. For example, you can either have a thin layer less than 0.2mm for gases but also need a layer thicker than 8mm for dust hazards, unless one of the other solutions is chosen. The problem is that the solutions are applied depending on the charging mechanism, and the installation. For example, the 0.2mm maximum thickness of layer may be appropriate for a thin polythene bag liner in a metal drum, which is filled with a powder. The powder transfer into the drum will generate static charge which can dissipate across the thin layer to the earthed metal drum. The >8mm thickness would be appropriate only in a powder process (Group III only) and is really a solution where a highly charged powder stream would be present, such as pneumatic conveying, or mixing in a non-metallic container (an earthed metal container would enable charge to dissipate harmlessly). Painted surfaces – Either limit paint thickness <0.2mm for Group IIC, 2mm for Group IIA or IIB or use a paint that can provide a dissipative coating, either meeting the <4kV breakdown requirements or surface resistance testing. There are also enclosure screws to consider, as static charge generated is stored easily in conductive parts that are of course isolated from earth. Small screws used to fix portable products together are unlikely to be a problem (it is generally accepted that small unearthed metal fasteners will not exceed 3pF), but all parts can be tested for their capacitance to verify they do not exceed the limits specified. If the metal parts are not accessible, then they are not required to be considered, or if the capacitance exceeds the limit, then an X condition is required to inform the end user. Certification Management Limited is an accepted ExCB (certification body) and ExTL (test laboratory). 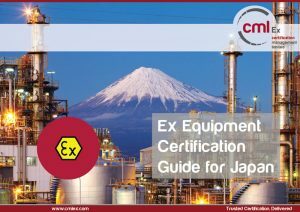 We can assess and test your products against IECEx standards and supply you with an IECEx certificate of conformity (C of C) and test report (ExTR). For more information on using IECEx approvals to gain access to international markets please see our market access section.